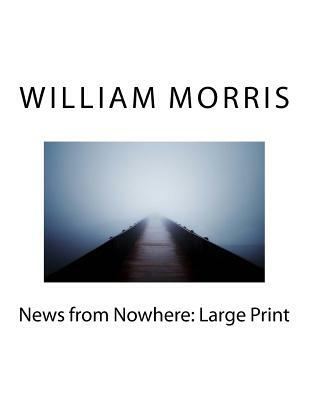 News from Nowhere: Large Print author: William Morris It was a beautiful night of early winter, the air just sharp enough to be refreshing after the hot room and the stinking railway carriage. The wind, which had lately turned a point or two north of west, had blown the sky clear of all cloud save a light fleck or two which went swiftly down the heavens. There was a young moon halfway up the sky, and as the home-farer caught sight of it, tangled in the branches of a tall old elm, he could scarce bring to his mind the shabby London suburb where he was, and he felt as if he were in a pleasant country place--pleasanter, indeed, than the deep country was as he had known it.